The ECAT 951/31R is a wholebody PET scanner. At the A&RMC, the PET scanner is used largely in 2D mode for multi-bed wholebody acquisition, 2D mode for neurological studies and 3D mode for neurological research studies. The scanner system consists of a gantry with onboard analogue to digital processing, a VME based acquisition control system, the ACS (Advanced Computational System) and a Sun workstation used for the operator interface to control acquisition and reconstruction of scans. Motion Control System - controls patient bed, transmission rods, septa, gantry tilt positions. Gantry communication - controls LLD, ULD settings. Filtered backprojection : reconstruction times 128x128 slice = 2.5 sec. Several scans are required in order to process an emission scan. These are divided into calibration scans and study scans. The calibration scans are performed weekly and consist of a normalisation and blank scan. 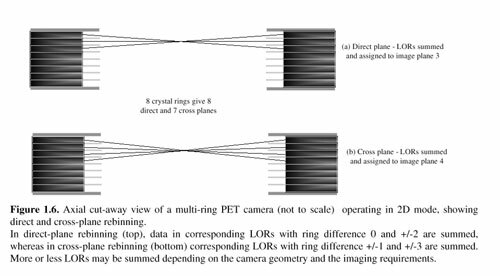 Normalisation scan; this is acquired with two scans, the first with the rod-sources extended and an empty FOV, so as to measure the cross-detector efficiencies. The second scan is acquired with a uniform calibrated source placed in the FOV. 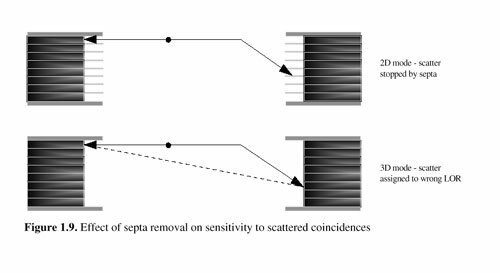 The nett result of these two measurements is the normalisation file which is used to correct emission and transmission scans. Blank scan; this is acquired with the rod-sources extended and an empty FOV so as to characterise the rod-source activity. The blank scan is then used to correct the transmission scan so that an attenuation correction can be generated. In addition to the routine 2D calibration scans above, a 3D efficiency scan is also acquired whereby the septa is retracted and a uniform source is placed in the FOV. This scan is used as a normalisation for 3D acquired study scans. Transmission scan; Ideally, this is acquired prior to the patient being injected with the PET tracer, however, in order to increase patient throughput it is more frequently acquired after the emission scan has been completed when the infused tracer activity is diminished. If acquired post-injection/emission acquisition, then there will be emission contamination of the resultant transmission scan, this is minimised to some extent due to rod-windowing whereby the encoded rod-position is checked against the geometry of the determined Line Of Response to eliminate non-transmission events. Typically, 10 minutes per bed position, though by applying a segmented attenuation correction, a scan as short as 3 minutes is possible. Local archiving to tape of all scans, normalisations, blanks, reconstructed images Archiving of all reconstructed images to RAID system, imported into Online Nuclear Medicine Image Database, archiving of RAID to 8-tape DDS-4 Autoloader. 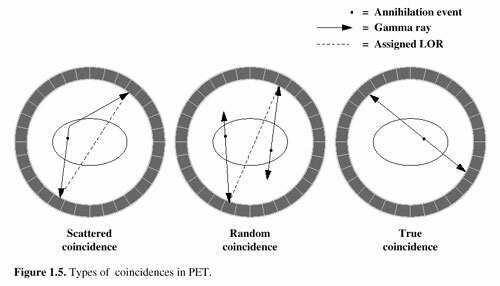 The two features that distinguish PET from SPECT are; the increased count-rate efficiency of due to electronic rather than physical collimation and the ability to simply correct for attenuation effects of tissue. 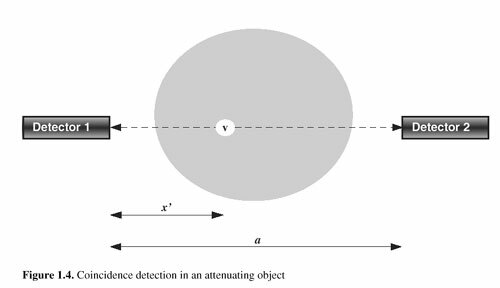 The ability to electronically collimate is due to the more sophisticated nature of photon detection, by detecting the 0.511 MeV pair photons resulting from positron annihilation. Four positron emitters are used routinely with the A&RMC PET facility. The table below outlines the properties of interest. The positron range contribution to the effective resolution is a result of the uncertainty in the point of the positron emission. 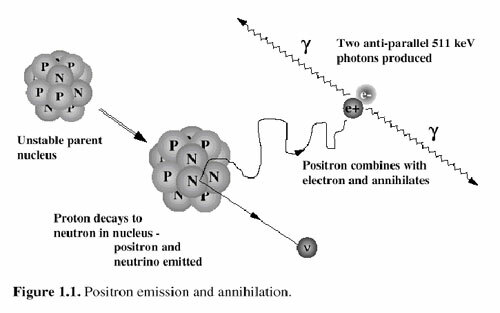 Positron paths follow a random path so that the integrated positron range is much larger than the separation between the positron annihilation and the positron emission point. For the isotopes of interest, the FWHM range is 1.0 - 1.5 mm. Photons emitted are absorbed as they pass through the body matter. 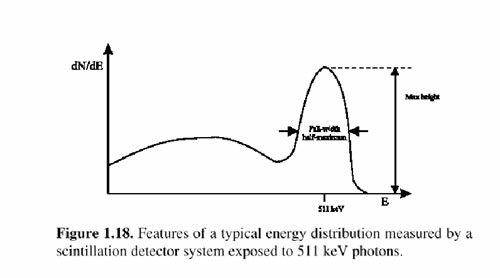 To quantify this, given I0 (cps) photons being emitted (where I0(x) = r (x).DV), then the effect of travelling through a medium is to reduce the number of counts detected, the source intensity is attenuated and is described by; or casting this as a probability, . That is, the probability that a photon emitted at point x=x' will be detected at x=0 is P(x). By taking the -ve of the natural log, we have: which when back-projected gives us a mu-map. The attenuation coefficient m(x) is a function of the attenuating medium's physical properties ( atomic number and density) and the energy of the photon (m(x,E)=s(E).r(x)). For water and 0.511 MeV photons, mwater(0.511MeV) =0.09695 cm-1, which gives a half-depth, the depth at which 1/2 the initial photons have been absorbed, of 7.15 cm. So the Line Of Response (LOR) can be corrected for attenuation effects by measuring the attenuation fraction anywhere along the LOR. The most convenient place to measure the attenuation is then outside the imaging FOV. This is achieved with a rotating 68Ge rod source and is measured prior to or post emission, the measurement is done with the septa extended (ie. 2D mode). It can also be measured simultaneously but that's another topic of discussion. From the above, you can see that in order to generate an attenuation correction, we need a measure of I0, the transmission rod's activity. This is the purpose of taking a blank scan and they acquired weekly as part of the scanner QA. A blank scan involves acquiring a sinogram with no attenuating medium in the scanners FOV. Also as part of the scanner QA, a normalisation scan is acquired which involves placing a uniform source (~ 2-3 mCi of 68Ge in a 6 litre volume) in the scanner FOV. 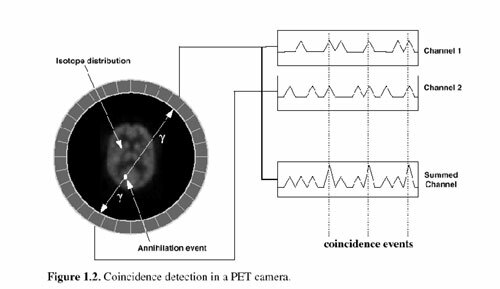 The attenuation file, p0xxxxtr1.atn, is used for attenuation correcting the LOR's of the emission scan. That is, the emission scan is corrected in sinogram coordinates. (Chang correction applied in image coordinates). 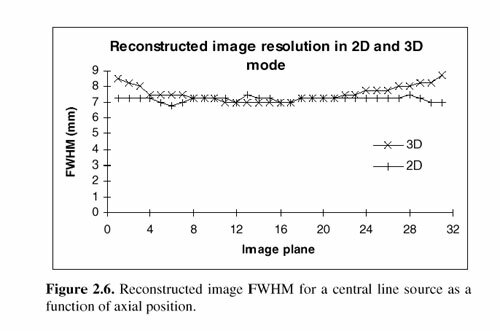 Normalisation refers to the correction of a 2d sinogram for different cross-detector efficiencies. This term is made up largely of intrinsic detector efficiencies * geometric efficiencies. Normalisation is measured by acquiring a 90 minute with the transmission rods extended. Scatter events result when one of the outgoing annihilation photons interacts (remember, mwater(0.511MeV) =0.09695 cm-1, => half absorbed within 7.15 cm) and scatters elastically (no energy loss) or inelastically with small energy loss so that it still is recorded in the LLD-ULD range (LLD=350 keV, ULD=850keV).